Developing their company for over 140 years, Kohler is one of the leading brands in the toilet industry today. 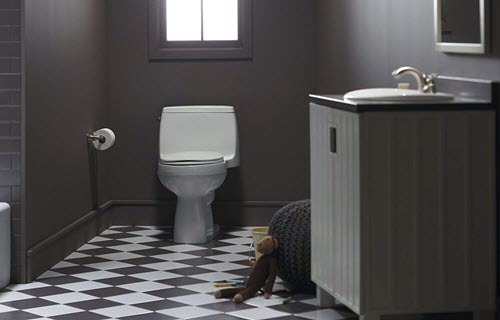 Kohler are one of the go-to toilet manufacturers when households are looking for high quality, top performing toilets. 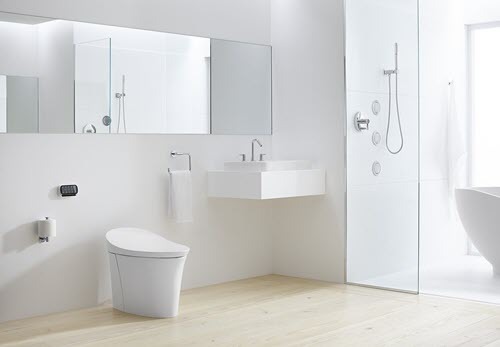 However, Kohler have many great models to choose from, so how will you decide which toilet is ideal for your bathroom. Well, in this article on the best Kohler toilet reviews, I have chosen ten of Kohler’s most popular models. Read on to see which toilets have made it on the list. The Kohler Cimarron collection has some great toilets to choose from. The Kohler Cimarron K-3609 has a tidy, sleek design and is one of the more popular Kohler toilets, highly rated by customers. 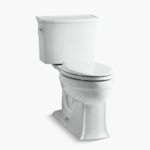 The Kohler Cimarron is a two piece toilet with an elongated bowl and a comfort height seat. A comfort height seat measures between 17″ and 19″ from floor to seat. The average standard height toilet measures between 14″ and 15″, so you can see that Comfort Height seating is a lot taller. A Comfort Height toilet benefits not only tall people but is also great for people that can’t stand up or sit down easily. The elderly, disabled and people recovering from surgery could benefit from this Kohler Cimarron toilet. The elongated bowl will also benefit people that need a bigger surface to sit down on. Round bowls are roughly 2″ smaller than an elongated bowl and are fine for smaller adults, children and great for small bathrooms. However, elongated toilet bowls are more suitable for large bathrooms and larger adults. Finally, this two piece design, looks very neat because of its smallish tank. Now, lets see how it performs. The Kohler Cimarron uses Aquapiston Technology to provide a powerful and efficient flush, every time. This toilet uses 1.28 gallons of water per flush (GPF), making it WaterSense certified. That is a 20% water saving compared to a modern 1.6 GPF, which is pretty good. However, if you are upgrading from an old standard toilet that uses roughly 3.5 GPF, then you will really save a lot of water. This water efficiency is not only great for water bill savings but also great for the environment. Of course, flush power is important also. A water efficient toilets is great in theory, however if you have to flush twice then it is not very efficient. The AquaPiston Technology provides an excellent flush that passes the ‘one flush is enough’ test. This Kohler Cimarron toilet should give you no complaints when it comes to flushing performance. The Cimarron collection use a DryLock Fast Install System, that prevents leaks and allows you to connect the tank to the bowl with ease. Two piece toilets can sometimes be tricky to connect and can also leak from time to time. However, the Kohler Cimarron is pretty good at solving these issues. 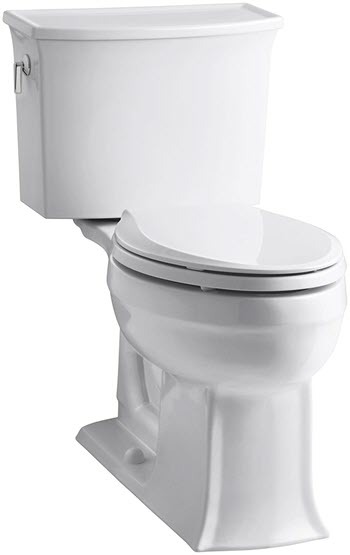 The Kohler Cimarron is a neat, comfort height, water efficient toilet that will look great in most toilets. If you would like to read a more detailed review on the Kohler Cimarron toilet, then follow the link. 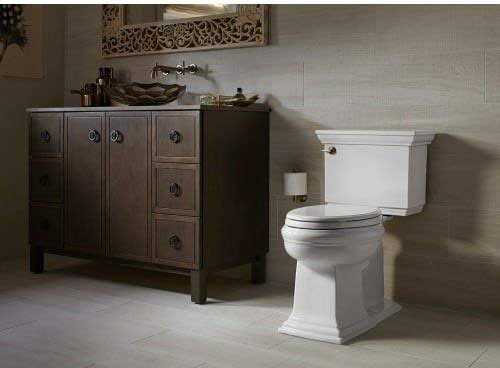 Taken from the Kohler Memoirs Collection, this K-3817-0 Memoirs Stately toilet has a classic design that will add a lot of style to your bathroom. Comparing to the Cimarron Collection above, Memoir toilets have a square shape. It is a personal decision on what type of design you wish to have in your bathroom, however if you like a sharp square shape tank, then you will surely like this toilet. Many modern toilets have a smooth round shape to the tank and bowl, however this toilet also has a square shape base just below the rim. It is a Comfort Height toilet, that is a couple of inches higher than a standard toilet. Comfort height toilets are great for taller people and also for people that find it hard to stand up or sit down. Standard toilets can be a little difficult for some people to use and in some cases can be a chore. It also has an elongated shape which is larger than a round bowl and gives more space to sit on. The Kohler Memoirs toilet is a WaterSense certified toilet that only uses 1.28 GPF. Its AquaPiston flushing system uses a flaperless canister that makes it virtually leak proof. This is a great feature to have for a two piece toilet because they are more prone to leaking. If you are changing over from an older toilet, you could save up to 16,500 gallons of water per year. This should save you a nice few dollars per year on water bills. This highly efficient toilet will also provide a decent flush as all Kohler toilets do. It also rinses an extra 50%, resulting in a cleaner toilet bowl after each flush. It has a standard 12″ rough in and is pretty easy to install. It is simple to connect the tank to the bowl and you should be able to handle the job yourself. If you would like to see a video of the installation process and how easy it is, make sure to have a look at the short demonstration video on the full Kohler Memoirs review. Whether you like a square tank or a tank with a smooth design, is for you to decide. If you like a classic looking toilet that will add a classy look to your bathroom, then the Kohler Memoirs is a good choice. It is highly efficient and performs as well as any other Kohler toilet. The Kohler K-3493-0 Highline Classic toilet is a very powerful, pressure assisted model that not only looks great but is also a ‘one flush is enough’ toilet. This two piece elongated model is certainly a nice looking toilet. Made of durable Vitreous China, it is has a antimicrobial glaze finish that will prevent the build up of dirt, mould and any odor causing bacteria. This glaze finish will keep your toilet cleaner and odor-free for much longer. It has a Comfort Height seat which is around 2 inches taller than a standard toilet, perfect for anybody having difficulty using a standard size toilet seat. This toilet is also ADA Compliant making it suitable for people with disabilities. The Kohler Highline Classic uses a Sloan Flushmate system that is both powerful and efficient. The Flushmate uses compressed air to force the water from the tank into the bowl, resulting in the water and waste being sucked out of the toilet bowl. A pressure assisted flush is usually more powerful than a gravity flush system, and the Highline is definitely powerful. It may be a little noisier than other gravity flush toilets, however, this is common among pressure assisted toilets. That being said, the flush noise is very brief. Each flush uses 1.6 GPF which is efficient but not WaterSense certified. This toilet is very easy to install. In fact, most people should be able to install it themselves. If you have the strength to lift the bowl and tank, then hiring a professional should not be necessary. If you would like to see how easy it is to install this toilet, then check out the video in the full review. Overall, this toilet is certainly an impressive model and is easy to see why it is so highly rated. If you are looking for a powerful, efficient, comfortable and attractive toilet, then the Kohler Highline Classic toilet would definitely be a good choice. If you would like to read a full review on this toilet and see how it compares to a leading competitor, then click on the detailed review link below. The Kohler Wellworth K-3987-0 is a budget friendly, elegant two-piece toilet. It will look great in any toilet, without breaking the bank. Although a more basic model compared to many other Kohler toilets in this article, it still looks great and performs very well. It is an elongated shape so it should be more comfortable than a round bowl, especially for larger users. However, it does not have Comfort Height seating. A Comfort Height toilet would be ADA compliant and measure over 17″ from floor to seat. A Comfort Height toilet would be more suitable for taller people and people with disabilities. The Wellworth has standard height seating, which measures roughly 14.5″ to 15″ from floor to seat. This height will make it more difficult for some people to use the toilet. However, a standard height seat will be more comfortable to use for short adults and young children. The Kohler Wellworth uses the Class Five Technology flushing system and also gravity to provide a powerful flush each time. It also consumes 1.6 gallons per flush which is decent but not WaterSense certified. Many of the other Kohler models reviewed here will only use 1.28 GPF which would provide 20% more water savings compared to a 1.6 GPF toilet. However, if you are upgrading from an old standrard toilet that uses around 3.5 gallons per flush, then you will still save so much water with this Wellworth toilet. Using a three bolt installation system to lock the tank to the bowl, this toilet is very easy to install. Modern toilets in general are not that difficult to install and there are many video demonstrations available to inspire you to give it a shot yourself. There are several installation videos on this site (check out the full review to see one). Overall, this toilet looks great and is one of the cheaper Kohler models available. It is a decent performing toilet that uses 1.6 GPF. 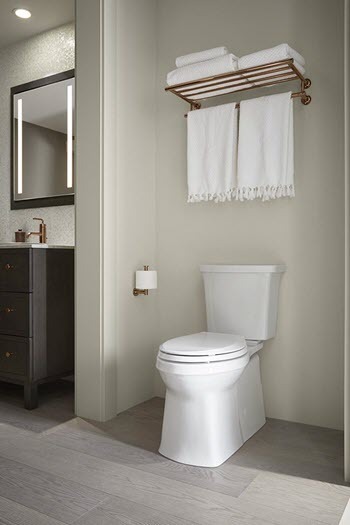 It is a standard height toilet, so if Comfort Height seating is important to you, then check out one of the other Kohler models. If you are looking for an affordable, standard model that flushes well, then the Kohler Wellworth toilet is a great option for you. If you would like to see a more detailed Kohler Wellworth review, then follow the link provided. The Kohler Santa Rosa K-3810 is an elegant, contemporary one-piece toilet that will definitely add a lot of style to your bathroom. Its powerful and efficient flushing system compares very well to other Kohler toilets. This neat, sleek model is a one-piece, elongated toilet. One-piece toilets are generally more expensive compared to a two-piece, however they are also easier to keep clean. With this unit, you don’t have to worry about nasty dirt and bacteria growing between the tank and bowl. It is also a Comfort Height toilet (ADA compliant) that measures similar to the height of a standard chair. An ADA compliant toilet makes it suitable for a wide range of users, especially seniors, the disabled and people recovering from surgery. It also has an elongated bowl, which is roughly 2″ longer than a standard toilet bowl. An elongated toilet is more comfortable than a standard toilet because there is more space to sit on. This toilet’s contemporary design looks very stylish and should look great in most bathrooms. The Kohler Santa Rosa uses the AquaPiston flush system that provides a powerful 360° flush, making sure every part of the bowl gets a thorough cleaning. The Santa Rosa uses 1.28 GPF, making it a WaterSense certified model. WaterSense certified toilets are great for the environment and will save you money on water bills also. In fact, this toilet will save 16,500 gallons of water per year compared to a standard toilet that uses 3.5 GPF. As with all Kohler toilets, the Santa Rosa is very easy to install. However, this model is a one-piece toilet, so it will be heavier than a two-piece toilet. Unlike a two-piece toilet where you can install one part at a time, you will have to lift this toilet all at once. It will be quite heavy (weighing around 100 lbs), however if that is ok, then you should have no problem installing this unit by yourself. Overall, this elegant one-piece toilet is well worth considering. It is powerful, efficient and comfortable. If you are looking for a contemporary one-piece toilet for your bathroom, then the Kohler Santa Rosa could be exactly what you are looking for. If you would like to see a more detailed review on the Santa Rosa, then follow the link. The Kohler Veil Intelligent toilet K-5401-0 is the first smart toilet reviewed in this article. If you haven’t heard of this intelligent toilet before, then you are in for a treat. These smart toilets have amazing features and make your toilet experience more comfortable, pleasurable and almost hands-free. Lets have look at what the Kohler Veil has to offer. The Kohler Veil intelligent toilet is a skirted, tankless model that is smooth and stylish. Its simple design is very unusual compared to regular toilets but its simplicity has its benefits. Its compact design takes up very little space, so it will be ideal for bathrooms of any size. It is tankless and has a smooth curved design, making it ideal for keeping clean. In fact, every so often a swipe with a damp cloth should keep this compact smart toilet looking brand new for years to come. The Kohler Veil looks great, however it is its features and performance that makes this toilet so intelligent. 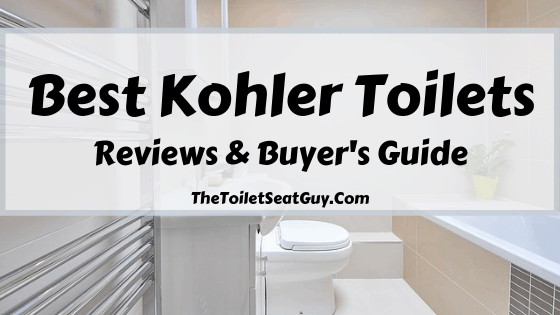 Read a more detailed review on this toilet to find out all the features the Kohler Veil has to offer, however here are a few of my favorite ones. Of course, a luxury toilet needs a bidet and this model has one. A wand will wash front and rear with pulsating or oscillating water and the water can be set to your desired temperature. If that’s not all, there is also a warm dryer to freshen you up after the cleansing is finished. Another thing I love about this intelligent toilet is its many automated features. First of all, you can activate the lid motion with a wave of your hand, so you can lift the lid, hands-free. Also, this toilet will automatically flush a few seconds after you step away. Next, it will automatically rinse to keep the wand and bowl clean and hygienic. And finally, just like the other automated features, the lid will close by itself if you forget to. Add an automatic deodorizer, a night light and other features, and you can see why this model is called an intelligent toilet. This tankless model has a powerful, efficient flush, that is a great water saver. It is a dual flush toilet, that uses only 0.8 gallons per partial flush and only 1.28 GPF for a full flush. Of course, this toilet is WaterSense certified and should save you money on water bills in the long term. It is also very eco-friendly. Don’t worry that using such a small amount of water per flush will not be effective. This toilet is very powerful and will not clog up. The Kohler Veil is an intelligent toilet and has to be installed near an electricity outlet. It may not be as easy to set up compared to a regular toilet, therefore many customers hire a plumber and electrician to install this unit for them. However, if you feel you are capable of installing this unit yourself, then there is a short installation video in the more detailed review. Also, in the detailed review you will find more information on the minimum water pressure details needed to get the maximum flush performance out of this awesome toilet. Overall, the Kohler Veil is a fabulous luxury toilet that will make your toilet experience a lot more comfortable. It is loaded with features that are either automatic or else controlled by the remote control included. It certainly is a very intelligent toilet, however luxury toilets are not cheap. If you would like to see a more detail review on the Kohler Veil Intelligent Toilet with videos and images, then follow the link. 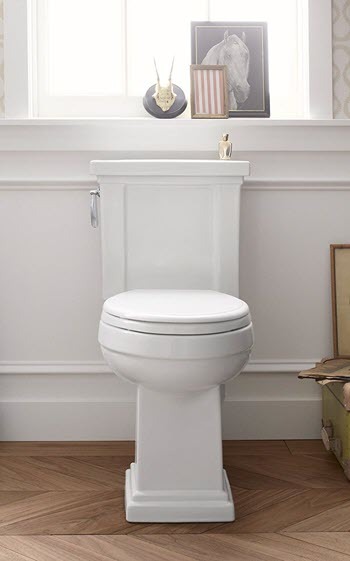 The Kohler Devonshire K-3837-0 is a traditional style toilet that has an elegant, classy feel to it. Kohler are dedicating this model to the bygone era of toilet design. It is a little different to other toilets in this article but it is easy to see why this model is one of Kohler’s more popular toilets. A traditional looking toilet, this model is taken from the Devonshire Collection. It has a square shaped tank, however what makes it different is the round protruding front. This round front makes the square tank look softer and more elegant. It is a two-piece model with an elongated bowl. Its sturdy square base is also quite tall as it is a Comfort Height toilet. With a seat installed, this toilet will have a seat height of over 17 inches. This makes it ADA Compliant and suitable for a wide range of users. A 17 plus inch toilet should be similar to the height of a standard kitchen chair. If you have trouble using a standard toilet, then you will find a Comfort Height toilet a lot more manageable. I highly recommend a Comfort Height toilet for seniors, people with disabilities and anyone recovering from surgery. The Kohler Devonshire uses gravity and the Aquapiston canister to siphon water out of the tank and into the bowl. A powerful flush enters the bowl at a full 360°, cleaning the entire rim and bowl. This 360° cleansing will be great for keeping the toilet looking spotless from all angles. Many people worry that a two piece toilet may leak because the tank and bowl are separate. Well, Kohler have this covered with the AquaPiston Canister. The canister has 90% less seal material exposed compared to a 3″ flapper, which means it is virtually leak proof. The toilet uses 1.28 gallons per flush, which is pretty efficient. It is WaterSense Certified and uses 20% less water compared to a 1.6 GPF toilet. This model is environmental friendly and will use 16,500 less gallons of water compared to an old standard toilet. If you are upgrading to this model from a standard toilet, then you will definitely save some money on water bills. The Devonshire is a two-piece toilet making it a little easier to install compared to a one-piece toilet. A two-piece comes in two parts, meaning you can install them separately. This will save your back from having to lift a 100 lbs one-piece toilet. This toilet will be no different to other Kohler models, so you should be able to install it yourself. If you would like to see how easy it is to install a Kohler toilet, then click through on the link provided to see a demonstration video. Overall, the Kohler Devonshire is a highly rated, very popular toilet, that looks both elegant and traditional. It has a good flushing system and is WaterSense Certified, using only 1.28 GPF. If you like the look of this design, then why not check out the full review on the Kohler Devonshire toilet, through the link. The Kohler Tresham K-3950-0 is an elegant toilet with quite a traditional style. It looks a little bit different to most other models but if you like the look of it, then lets see what it has to offer. The Kohler Tresham toilet has a very distinctive look. The tank is square, the base is square and even the indent at the front is square. It does look quite charming though, and for me is very different to the more curvy and smooth modern toilets. It is a Comfort Height toilet and is ADA Compliant. ADA Compliant toilets are roughly 2″ taller than a standard toilet seat, making them more suitable for a wider range of users. This toilet will feel similar in height to a kitchen chair, so if you would prefer a taller than standard toilet, a Comfort Height toilet is the perfect option for you. The Tresham is a two-piece, elongated toilet. Two-piece toilets will have a tiny gap between the bowl and tank, as they are separate. This shouldn’t be an issue, however dirt and mold can accumulate in this area, so a two-piece toilet will need a little extra cleaning, compared to a one-piece. Also, an elongated toilet bowl is around 2″ longer than a round bowl, making it a lot more comfortable to sit on, for most users. 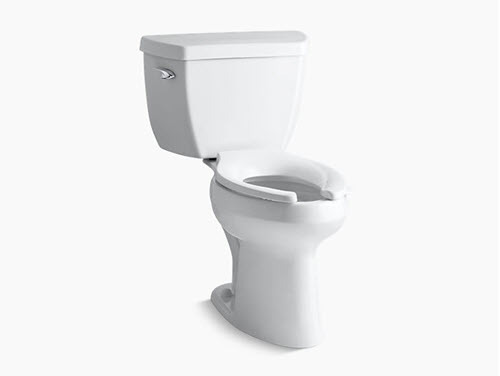 This toilet uses AquaPiston Technology and gravity to provide a powerful flush of water to 360° of the rim and bowl. This is great for cleaning the whole of the toilet bowl and not just parts of it. The AquaPiston canister compares very well to a regular 3″ flapper, and it provides a leak-proof performance. The Tresham is very water efficient also. Using just 1.28 GPF, it is WaterSense Certified. If you are changing over from a modern 1.6 GPF toilet, then the Tresham will save you 20% water per flush. If you upgrading from a standard toilet, then the Tresham will save around 16,500 gallons of water per year. This toilet will not only save water but save you money on water bills also. This is a two-piece model, so should make installing it that little bit easier. Unless you have problems lifting heavy objects, then you should be able to install this unit yourself. The base can be installed separately and then the tank connected afterwards. If you would like to see how a Kohler toilet is installed, then check out the short video in the full review. The link is just below. Overall, the Kohler Tresham is a more traditional style toilet compared to many of Kohler’s other models. It has a powerful flush and is very water efficient. It is also a Comfort Height toilet and will be more comfortable for a wide range of users. If you would like to see a a full review on the Kohler Tresham toilet, with videos, images and the current price, then follow the link. The Kohler Corbelle K-3814 is an unusual model compared to other Kohler toilets. It looks different but is certainly a nice looking toilet. Let us see what it has to offer. The big difference the Kohler Corbelle has compared to other Kohler models is its extra wide base. It doesn’t really have any designs, just a smooth surface. The smooth surface is great for cleaning because not much dirt can accumulate on it. A damp cloth every now and again should keep the base looking clean for many years. The unusual shape of the base is very wide. In fact, there isn’t much of a difference in width between the base, bowl and tank. It is a Comfort Height toilet and ADA Compliant. Comfort Height toilets are taller than regular toilets and suitable for many different users. Seniors, people with disabilities, tall people and anyone that has trouble using a standard size toilet, will benefit from Comfort Height seating. The Kohler Corbelle is a two-piece, elongated toilet. The tank is quite regular, however, it does have a vertical handle lever on the left hand side. It is a personal decision whether a vertical handle is a feature you would like. A horizontal lever is far more common. The Corbelle uses Kohler’s 360° Revolution toilet flushing system to thoroughly clean and rinse the bowl with every flush. Also, its AquaPiston canister provides a powerful, leak-proof flush, that is very efficient. This model uses only 1.28 GPF, making it a WaterSense Certified toilet. WaterSense Certified toilets are not only eco-friendly but also great for saving money on water bills. The Kohler Corbelle has a great installation feature that makes installing this toilet very easy. It doesn’t take any expertise to install a modern toilet, however with Kohler’s ReadyLock Installation System it has become even easier. No drilling necessary with this model. Have a look at the demonstration video on the full review, to see how cool the ReadyLock System is. Also, remember that this toilet is a two-piece model, making it easier on your back. You will be able to install the base first and then connect the tank afterwards. Two separate pieces will be easier to lift, compared to a heavy one-piece toilet. 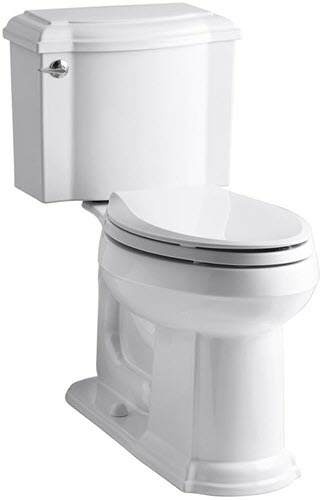 Overall, the Kohler Corbelle is a distinctive, wide base toilet that looks unique compared to most other Kohler toilets. Its smooth base design not only looks great but also makes it easier to maintain and keep clean. It is also a powerful and efficient toilet, with Comfort Height seating. The Kohler Corbelle is an impressive toilet and certainly worth considering for your bathroom. If you would like to see a full review on the Kohler Corbelle toilet with videos, images and the price, then follow the link. The Kohler Archer K-3551 is an elegant toilet that will look great in most bathrooms. I really like the look of this model, especially the base. Lets see how well it performs. The tank is simple in design, however the base really stands out for me. The front has beveled edges that gives it a very stylish look. It is also a Comfort Height toilet and ADA compliant. The Archer will measure over 17″ from floor to seat, making it ideal for tall people, seniors and anyone that finds it difficult using a standard toilet. Using Kohler’s AquaPiston Technology, the Archer is a powerful and quiet toilet. The AquaPiston canister provides a full 360° flush that will clean the entire inside of the bowl. The canister is also very durable and has 90% less seal material exposed compared to a 3″ flapper. This why Kohler boasts a leak-free performance. The Kohler Archer is WaterSense certified, only using 1.28 gallons of water per flush. This is a highly efficient flush, consuming 20% less water compared to a 1.6 GPF toilet. This toilet will be ideal for saving money on water bills and will also help reduce your carbon footprint, especially if you are currently using a standard 3.5 GPF toilet. In fact, if you are using a standard 3.5 GPF toilet, then the Archer will use 16,500 less gallons of water per year. This toilet is a two-piece model and will arrive in two parts. Two-piece toilets should be a little easier to install because you will not have to lift a heavy 100 lbs one-piece. Sure, you will have to connect the tank to the bowl, however this is quite a simple task. In fact, it has become even easier now because Kohler have developed a DryLock installation system for the Archer range. This system not only makes installation easier but also prevents any leaks. Most modern toilets are relatively simple to install, and the Archer is no different. There are many video demonstrations on YouTube that will give you an idea whether you can self install this toilet. Overall, the Kohler Archer is a great looking model, that has a simple but elegant design. It has a powerful, quiet and water efficient flush. The Archer is also a Comfort Height toilet that will be suitable for most users, especially taller individuals. If you like the look of this model, then check out the full review. The Kohler Archer full review will have videos, images and the current price, to help you make a more informed decision. Just follow the link. Buying the perfect Kohler toilet should not be rushed. Hopefully, you will be using this same toilet for several years to come so it is important you find the perfect model for your bathroom. Here are some of the factors you should consider before buying a Kohler or any other toilet. The first thing to consider when buying a new toilet is whether to purchase a one-piece or a two-piece toilet. As already stated in this article, this is a personal decision on whether you like a one-piece or two. However, there are a couple of things to take into consideration. First of all, a one-piece is heavier. If you are planning to install a one-piece toilet by yourself, then be prepared to lift a toilet that will weigh around 100 lbs. Secondly, one-piece toilets are easier to clean. Dirt, mold and bacteria will find it easy to accumulate between the tank and bowl of a two-piece toilet. This will mean extra cleaning every now and again to keep your toilet looking nice and fresh. Thirdly, standard two-piece toilets were prone to leaking because the bowl and tank were separate. However, this is far less likely to happen with these modern toilets because of advancements in technology. In fact, with the Kohler’s AquaPiston canister design, they boast a leak-free performance. Finally, a one-piece toilet is more expensive to buy, compared to a two-piece. As you will already know, the two most common toilet bowl shapes are round and elongated. Both have their positives. All of the toilets reviewed above are the elongated version, however if you are looking for a round bowl, then there should be one available also. Elongated bowls measure over 18-1/2″ in length, where as round bowls measure less than 16-3/4″ in length. An elongated bowl may also be a small bit wider compared to a round bowl. The main reason you may want to buy an elongated toilet bowl is for comfort. Round bowls are small and unless you have one specifically for children, then an elongated toilet bowl is far more comfortable for adult use. Besides being more comfortable for small children, a round bowl may also be more suitable for tiny bathrooms. 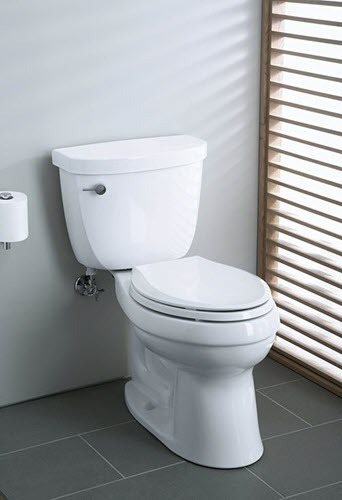 Elongated toilets are longer than round bowl toilets, therefore will take up more space. The dimensions of each of the toilets above are on the full reviews (links are provided above). If you have a small bathroom, measure the area you will place the toilet and check the dimensions provided. This will be especially the case if you are changing from a round bowl toilet to an elongated version. Are you a tall person? Will there be an elderly or disabled person using the new toilet? If the answer is yes, then it may be worth considering buying an ADA compliant Comfort Height toilet. Comfort Height toilets measure over 17″ from floor to seat, making them a lot more user friendly. They measure over 2″ taller than a standard toilet and will be similar in height to a standard kitchen chair. If you or a family member find it difficult using a standard toilet height or find it difficult to stand up or sit down, then a Comfort Height toilet is definitely worth considering. 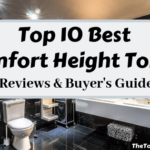 There are many Comfort Height toilets reviewed in this article for you to choose from. Depending on your budget and how much luxury you want, you can choose to have a regular toilet or a smart toilet. Smart or intelligent toilets offer so much more than a regular toilet. A smart toilet will make using a toilet such a pleasure that you will probably spend too long in the bathroom. With features like a bidet, heated seat, dryer, deodorizer and many more, there is some serious technology involved in these toilets. However, they also come at a serious price. Smart/Intelligent toilets are definitely a luxury item and are a lot more expensive than a regular toilet. All the leading brands are improving their flush technology year on year and Kohler is no different. 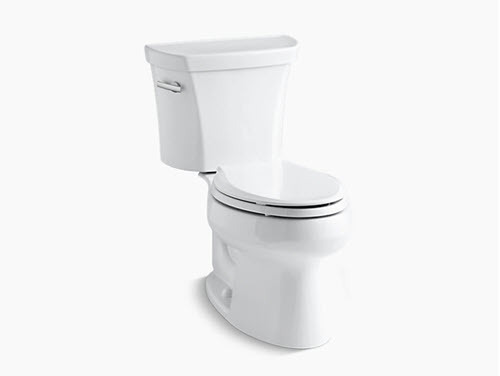 Kohler toilets have powerful and efficient flush systems that are very highly rated. If you are interested in lowering your water consumption, then a WaterSense certified toilet is a good option. To be WaterSense approved, a toilet must use less than 1.6 gallons of water per flush. When compared to a standard toilet that uses 3.5 GPF, a WaterSense certified toilet will make a big difference. You can also consider a dual flush toilet that will give you the option of a half-flush and a full-flush. A half-flush toilet typically uses less than 1 GPF, where as the full flush will still be 1.6 GPF or less. Toilets are available in all different sizes, so make sure that the one you want will fit your bathroom. The rough-in measurement is the distance between the wall (not including skirting boards) and the toilet bolts to the floor. The standard rough-in measurement is 12″, however some bathrooms will have a 10″ or 14″ rough-in. Make sure you have the right rough-in measurement before you purchase a new toilet. As you can see, Kohler have a wide range of fabulous looking toilets for you to choose from. All of the toilets reviewed in this article are highly rated in performance and efficiency. Each toilet will have a link to a more detailed review if you would like to see some more information on that specific model. I hope you found this article on the best Kohler toilet reviews helpful and now can make a more informed decision on whether a Kohler toilet is right for your bathroom. If you have any other questions on Kohler toilets, then leave a message in the comment section below.